fabrifoam® is a patented composite material that is elastomeric, open-celled, thermoplastic, non-latex foam with selected high quality and specifically engineered fabrics. fabrifoam® breathes, helping to reduce or eliminate maceration while retaining the healing benefits of heat therapy. It has exceptional elongation and recovery properties, is very durable, will not fray and is Velcro® hook receptive, assuring secure closure that allows for easy adjustment and secure compression/support therapy. Support from these unique devices remains constant. This unique composite material was developed for use by various medical professionals, including, physicians, physical therapists, certified athletic trainers and related health care providers. This extraordinary non-latex composite can be used safely and repeatedly to achieve optimal benefits when compression/support therapy is required. 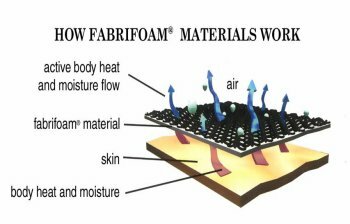 Many benefits to fabrifoam® products include: Breathable - Wicks Away Perspiration, Safe, Washable & Durable, Infinitely adjustable because it is Velcro® Hook Receptive, Optimizes Hot/Cold Therapy, and Provides Maximum Compression.